Before you can determine a frog's gender, you need to know the frog's species, because male and female characteristics vary from one species to another. Appearance, mating behavior and calls can be good gauges of frog gender as long as the species is known. If you're unable to identify a frog's species, consult a veterinarian or other expert who specializes in amphibians. In most frog species, the female is larger than the male, so frog size relative to a standard can be a good method of gender identification. In some species, the female frog is darker in color than the male, and in others, the male is darker. Also, males in many frog species have different markings and spots on their bodies than females do. You can often identify a male frog from a female by looking at the area next to each eye on the outside of the frog's body. It is circular in shape and is called the tympanum or eardrum. In the green frog, bullfrog and carpenter frog, the male's tympanum is larger than his eye, whereas the female's tympanum is smaller or the same size as her eye. You can observe frogs' mating behavior as a way to identify their gender. During mating season, the male frog hops onto other frogs' backs. He hops on both males and females in the process of looking for female mates, but he'll stay on a female, climbing onto the female's back and holding onto her as she lays eggs. During the mating season, male frogs' throats are darker in color than female frogs' throats are. In most frog types, the male is the only gender that calls. However, in certain species, frogs of both sexes call. In those species, males and females sing different songs. A male frog calls to attract females. When he does, the vocal sac on the front of his neck balloons to three times as large as his head. Hundreds or thousands of male frogs can be singing and trying to attract mates at the same time. Male frogs also call to keep other males away from their territory. They typically make most of their vocalizations at night, but you can sometimes hear them calling during the day, too. How Long Do Frogs Stay Together After They Mate? How to Tell if a Poison Dart Frog Is a Male? What Kind of Frogs Have Spots on Their Sides? 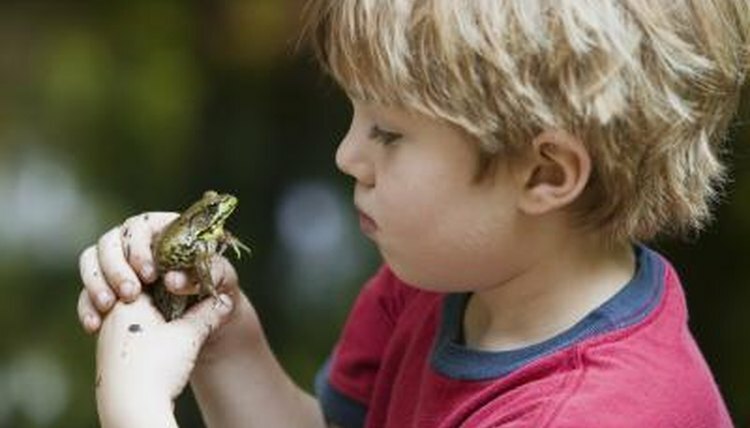 What Sensory Organs Are Found on a Frog's Head? What Kind of Frogs Live on Dry Land?